This exceptional jamonero will be the talk of the party when you gather together with friends for a bit of sophisticated indulgence. You will feel like a true professional ham carver with this elegant yet practical device. Knowing that the quality of the ham cut is a key factor in evaluating the quality of acorn-fed 100% ibérico ham, it’s clear that the right ham stand is essential to ensure your jamón ibérico is properly secured during carving. 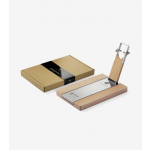 Made of beechwood and stainless steel, the Cinco Jotas ham stand by Lodiví combines elegance, design and functionality to achieve the perfect cut of Cinco Jotas acorn-fed 100% ibérico ham. 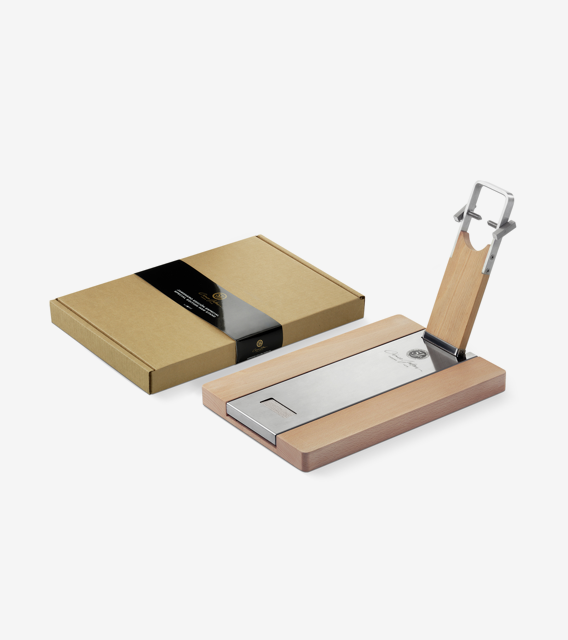 Thanks to its firm anti-slip base, this stand facilitates the art of carving and ensures optimal conditions for tasting. Fully foldable in three easy steps, its versatility allows for easy cleaning and storage. If you own your own ham stand, you're clearly serious about getting maximum pleasure out of your jamón ibérico. You’re probably also on top of staying healthy too. Cinco Jotas Iberian ham has you covered on all fronts. Owning your own jamonero means you enjoy the finer things in life and take pleasure out of treating yourself to the very best. With the Cinco Jotas ham stand by Lodiví you can enjoy the exclusive experience of carving your very own acorn-fed Iberian ham, a culinary indulgence you will appreciate for years to come. Cinco Jotas acorn-fed 100% jamón ibérico are made from ibérico-breed pigs who enjoy free-range lives in the Spanish dehesas (meadows), feasting on all that nature intended: wild grass, aromatic herbs, fragrant roots, mushrooms, and, of course, acorns. All this contributes to a nutritious end product rich in healthy oleic acids, similar to the extra virgin olive oil so revered in the Mediterranean diet.